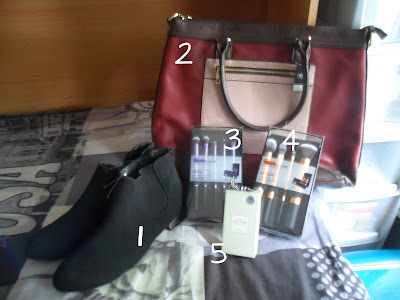 I have been shopping and internet shopping over the past week, and have bought a fair few items! Please excuse the poor photo quality, it appears my camera is playing up! 1) Chelsea Boots – I bought these lovely boots from my local Next Clearance store (if you haven’t been to one, check it out! ), they were made specifically for the Clearance stores so they can’t be found online. I bought these for £26 and they’re made of a lovely suede type material. 2) Tote Bag – I bought this from Next, you can buy the bag here for £32. The use for this bag will be for college, as it is big enough to fit massive folders and textbooks in! 3) Real Techniques Starter Set (Your Eyes/Enhanced) – This contains 5 brushes, the Base Shadow Brush, the Deluxe Crease Brush, an Accent Brush (for smudging or highlighting), the Pixel-Point Eyeliner Brush and a Brow Brush. You can buy these here. 4) Real Techniques Core Collection (Your Base/Flawless) – This contains 4 brushes, a Detailer Brush (for concealer or lipstick), a Pointed Foundation Brush, a Buffing Brush and a Contour Brush. You can buy these here. I bought both my Real Techniques brush sets from Boots, as currently they have a buy one get one half price offer on. So instead of me paying £43.98, I paid £32.98, the same price for both on Amazon but with Advantage Card Points! 5) New York Eau de Parfum 50ml – This was bought from Next for £8! I bought it after trying the tester. I picked this dress up originally when I was in Leeds for Leeds Festival last week in a size 10. However when I tried it on, I found that it didn’t fit and I couldn’t actually breathe in it! So on my trip to my local Next Clearance to notice the exact same dress in the same colour in one size up was amazing! I am so happy I found this because you can hardly find it online, especially for £27.50! However, it is available to buy from Asos for £38.50. As soon as I saw this top, I thought that it was beautiful and I had to have it. You can buy this top in limited sizes from Bank for a limited time only. I picked this beauty up for £17.50 in my local Next Clearance. I had wanted this blouse for absolutely ages and there is no doubt about it. When I saw it in Next Clearance for £15.20 I couldn’t resist! Unfortunately this is no longer available to buy online. I saw this top in Next Clearance in Leeds and instantly fell in love with this casual but feminine top, especially for only £6! It’s a great alternative to just wearing a t-shirt. They may still have these available here. As I was browsing through my Next Directory, I saw this beautiful watch and had to have it. I am an absolute sucker for rose gold, and have not owned a watch in a very long time! You can pick one up for £15! When these arrived at my house and I tried them on, I was unsure whether to keep them. My ‘tall’ height of 5’7″ makes me pretty self conscious in heels, as if I look like a giraffe, or something along those lines. But then I decided, I don’t really care if I look too tall in them, I love them and I’m keeping them! If you too are a fan of these beautiful shoes, you can purchase them for £18.